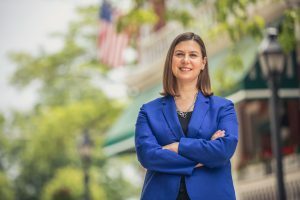 Congresswoman Elissa Slotkin represents Michigan’s 8th congressional district, which includes northern Detroit suburbs and extends through mid-Michigan to Lansing. She unseated incumbent Rep. Mike Bishop in 2018 to win the seat. Rep. Slotkin is a former intelligence and senior Pentagon official who served three tours in Iraq alongside the military, serving both Democratic and Republican administrations. Starting her career after 9/11/01, Slotkin served in the CIA, the Office of the Director of National Intelligence, the White House, State Department, and in senior level positions at the Department of Defense as Acting Assistant Secretary of Defense for International Security Affairs in the Obama Administration. During her five-year tenure at the Pentagon, Slotkin worked on security strategy and policy issues related to the Middle East, playing a critical role in counter-ISIS strategy and in advocating for the passage of the Iran nuclear deal. She also visited Israel regularly — working on the Iron Dome and additional military systems that protect Israel. During this time, she formed close relationships with Israeli security officials that she continues to maintain. Slotkin is a strong supporter of the two-state solution to the Israeli-Palestinian conflict, having spent time in Israel and the West Bank prior to her government service.